Six of our students participated in the THIMUN conference at Singapore last week. It was a happy mix of learning and fun. Being a part of such a big conference was an overwhelming experience but they quickly learnt to get their voices heard in the vibrant and engaging debates. Krish na – Being inthe committee in a large conference was a first time for me and was an eye opening experience. Overall, the conference was a great confidence booster for me as I don’t talk as much when surrounded by a lot people. Being in a large council forced me to do that and give speeches during sessions. I feel that it was worth going there as the experience was truly breathtaking and was worth all the time that I spent preparing for it. I hope to go to more conferences like this in the near future. Added to that, being in the auditorium for the Opening Ceremony was exhilarating especially because of the presence of the Ambassador of Netherlands to Singapore. Animan: Today was all of our first times being in such a large conference, with more than 150 people in my committee. However, once we got there and saw everything, it just lightened up for me, and I suddenly didn’t feel nervous any more. Overall, I think that THIMUN Singapore has changed my whole view of MUN. My fears of public speaking are completely gone. I don’t think I’ll be able to forget this experience, as we got so much exposure to the real world in only 6 days. Anish: I really enjoyed being in council and watching the heated debate take place. I managed to give two speeches on two different topics. 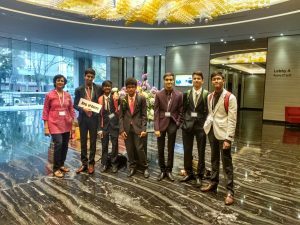 Uday: THIMUN 2016 was truly a learning experience for me. Going in, I was absolutely terrified; I had a heard a lot about the conference from my friends: how big it was, how well prepared all the delegates were, and how high the overall quality of debate was. The way I saw it, the only way I was going to be able to contribute to my committe e was by doing enough research. I spent weeks researching every aspect of my country, the topics, wrote resolutions, and went as far as to make a list of analogies to use during debate. What I found there surprised me, however. I found that the people there were completely ordinary; they were just like anyone else I knew. The second I accepted this fact and stopped thinking that I would never be able to stand up to them, was when I really began my THIMUN experience. I could suddenly connect with like-minded individuals; I was able to make allies, merge resolutions, and yes — even debate. I was astounded by the amazing points being brought up by those around me, but I also managed to surprise myself by the amount that I was contributing. I learned the value of doing enough research; it allowed me to be on equal footing with the other delegates. 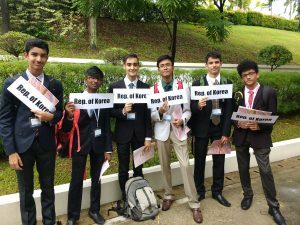 I had a great time at THIMUN. I learned what a large scale conference looks like, made plenty of new friends and furthered my own MUN career. I am truly grateful for the experience, as I believe it has had a profound impact on me, both as a delegate, and as a student. I will cherish my time in Singapore for a long time to come. Ahaan – I enjoyed the conference. Initially, I struggled to get an opportunity to speak, however, as the day progressed I got more chances to express my thoughts. The quality of debate was nothing like I had experienced before. Making POIs in front of hundreds of delegates definitely improves my confidence. Overall, I had a very fruitful experience. 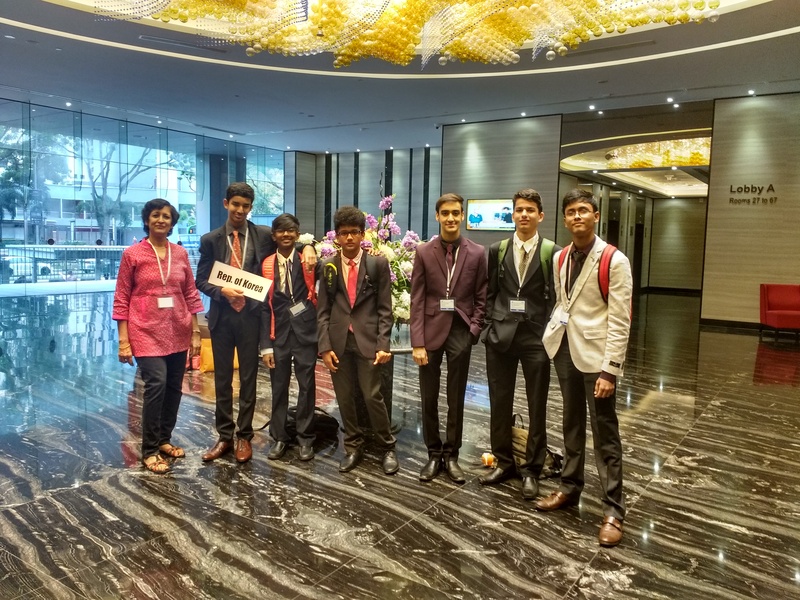 Aditya: I got to see the work of several delegates and it was interesting to see the different viewpoints of the delegates as they challenged each other. I too got caught up in the moment and critiqued resolutions and got to meet new people and make note friends.